So you've found a new modification that you'd like to use on your Icy Phoenix website? Many modifications you'll find here and on other websites will have special instructions letting you know you'll be adding new or altering some tables to your database. For those type of modifications to work, you'll need to update your database. Assuming you know how to access your Icy Phoenix database, look to see what your tables are prefixed with. If you installed Icy Phoenix using the default prefix, your database tables will have "ip_" in front of them. Many users are used to prefixing their tables with the "phpbb_" prefix. In fact, it doesn't matter what you use as your prefix when installing a fresh copy of Icy Phoenix. What matters is you are consistent and remember to name all future prefixes the way you started. Clearly the prefix that is used in this example is "ip_". What if your database prefixes are not "ip_"? You simply change the "ip_" prefix in the install instructions to whatever your prefix is. In the picture to the right, my database tables are prefixed with "phpbb_". Since my table prefix is "phpbb_", I must make sure that I change these install instructions to fit my prefix. 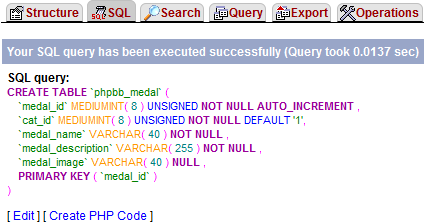 I was then told "Your SQL query has been executed successfully (Query took 0.0137 sec)". Keep following the special SQL instructions in the install file until you are finished. Very good one , Chaotic. this is absolutly the easy to follow version off this issue. It's a bit lengthy, but I think it needed to be. Details are everything and if this DOC helps just one person, it's done the job.